I have been very lax at keep this blog updated, and I fully admit that I have been spurred onto writing this entry tonight (an hour before bedtime) because my blog worthy foodie adventures are starting to pile up unrecorded. I could blame work, but the truth is since I last entered the blogosphere I have watched 3 seasons of Fringe and spent countless hours aimlessly trawling through my Twitter feed. I have planned to write many a time, but it’s so easy to be lured away by a pint outside on a sunny summer Sunday afternoon. My friend Matt said that if you are a writer you always find time to write (ironically he said this on the aforementioned sunny Sunday), so I am probably not a writer. This doesn’t bother me too much. Writing can join the ever-increasing pile of discarded hobbies that grows year on year – from the short-lived violin playing days of my childhood (didn’t like my new teacher so quit), to running and knitting (which I haven’t done for months but still list as interests to make me look well-rounded). One thing that I never lose interest in however – is eating. A love of food has been ever-present in my life. A good friend Tanya pointed out that all of my boyfriends have loved to cook – as if this was a coincidence, not a well thought out life choice. And as fate would have it, I ended up married to a MasterChef. My stomach always looks out for me. One of the perks of being Tim’s wife is that I got to go to the BBC Birmingham Good Food Show in mid June. 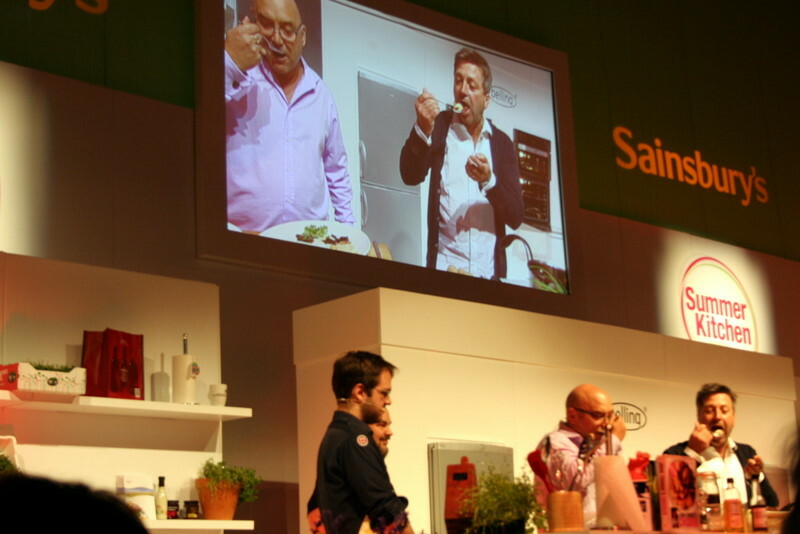 In 2009 they combined with MasterChef and now do cook offs between past champions, cook schools (where participants can cook along with John, or a previous contestant) and even a mini MasterChef competiton judged by John and Greg with audience members.